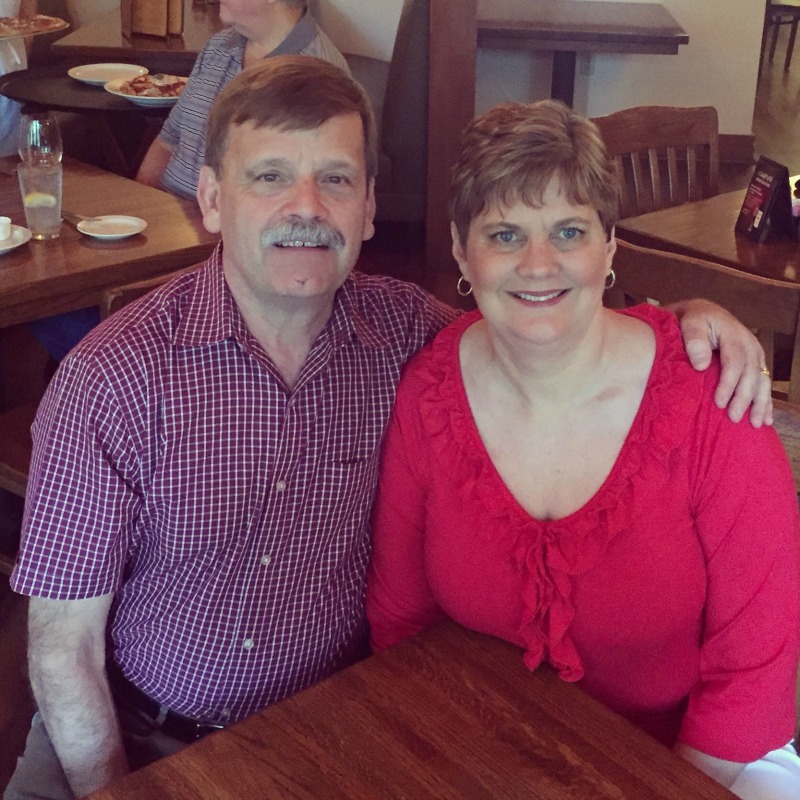 Tony and I recently celebrated our 33rd wedding anniversary. This year we opted for our favorite Italian restaurant that is casual and close to home. It’s in an old house surrounded by a beautiful wooded area – great for pictures! For the occasion, I wore the Ruffled Neck with Bell Sleeve Top from Covered Perfectly. This post contains some affiliate links for your convenience. If you purchase a product through my link, I may receive a small commission. I so appreciate every click-through and purchase! Every little bit helps to keep My Side of 50 up and running! Disclosure: Covered Perfectly provided the top for this review. Opinions expressed here are my own. I LOVE Covered Perfectly. 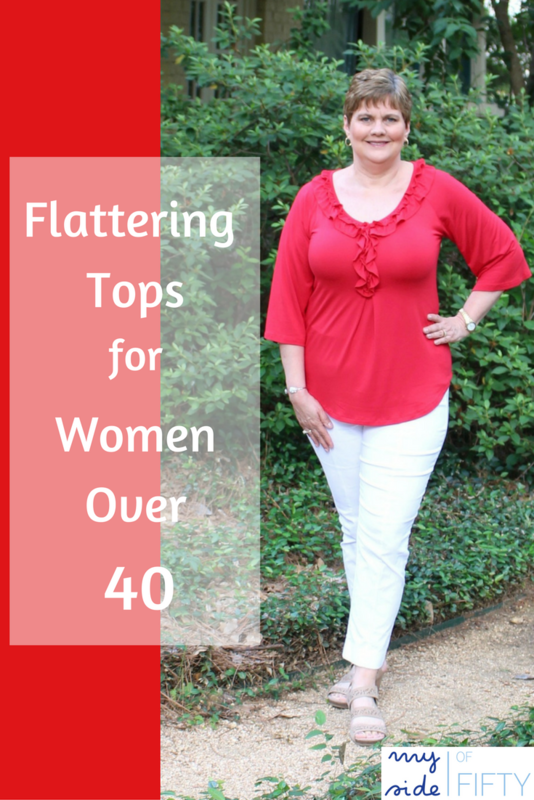 Their tops are made to be flattering and comfortable for women over 40. I felt so good wearing this Ruffled Neck With Bell Sleeve top. It’s micromodal fabric is SO SOFT. The V-neck is super flattering and it doesn’t come too low. The ruffles are a pretty detail, as are the 3/4 length bell sleeves. It has a soft pleat in the front that does a great job hiding my tummy, which is always an issue for me. I like that it skims my body for a smooth silhouette. It’s machine washable, American made, and also comes in black. What more could you ask for? My Side of 50 readers get a 20% discount on up to two items! Use the discount code MS20 when you check out at Covered Perfectly. There are several styles to choose from, and the discount will apply on up to two items. You may also take advantage of the buy 2 get your 3rd free special. Only one discount per order. Like this post? Subscribe to My Side of 50 and get 3 Ways To Tie A Scarf – FREE! Plus a weekly e-mail with all my blog posts PLUS special deals and bonuses for SUBSCRIBERS ONLY! 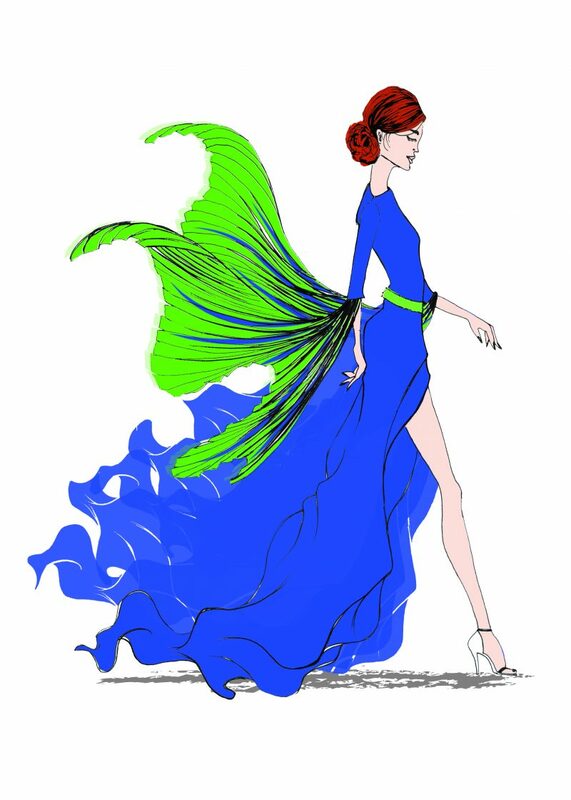 And here is a review from my friend Jodie at Jodie’s Touch of Style. Brutal Honesty About Covered Perfectly Shirts for Women Over 50. 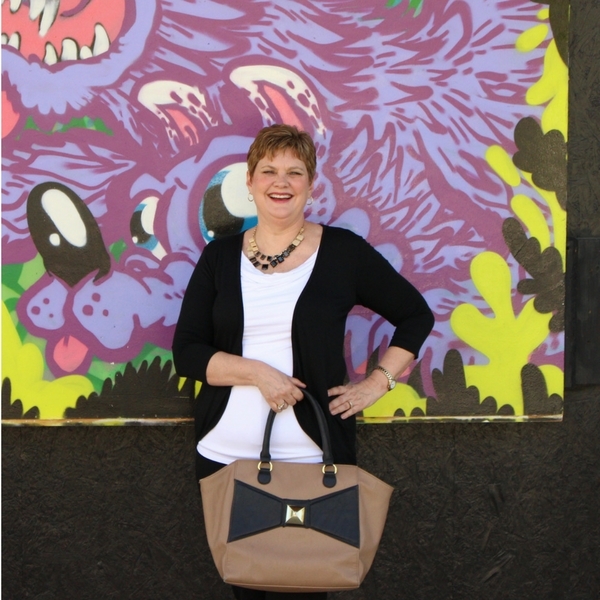 Glenda K. Harrison, the blogger behind So What To Twenty, has true style. She been a blogging friend of mine for the last year. 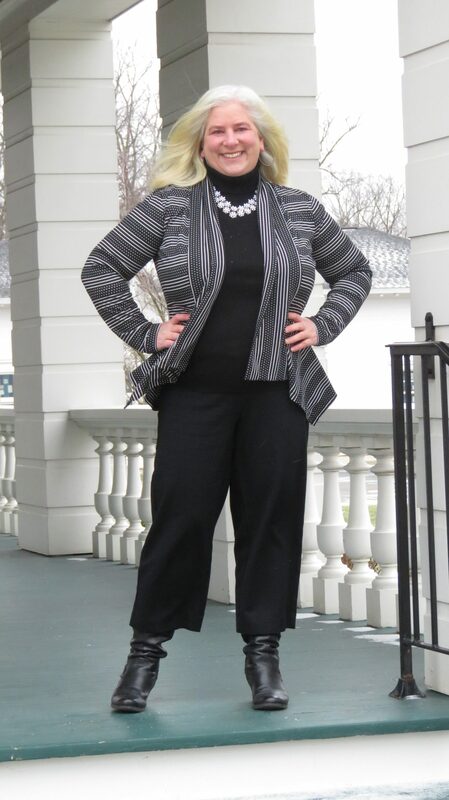 I have featured her in some of my fashion posts and she has even done a guest post on my blog, My Side of 50. I admire her greatly, not only for her fashion sense but how she presents her authentic self through all she does. 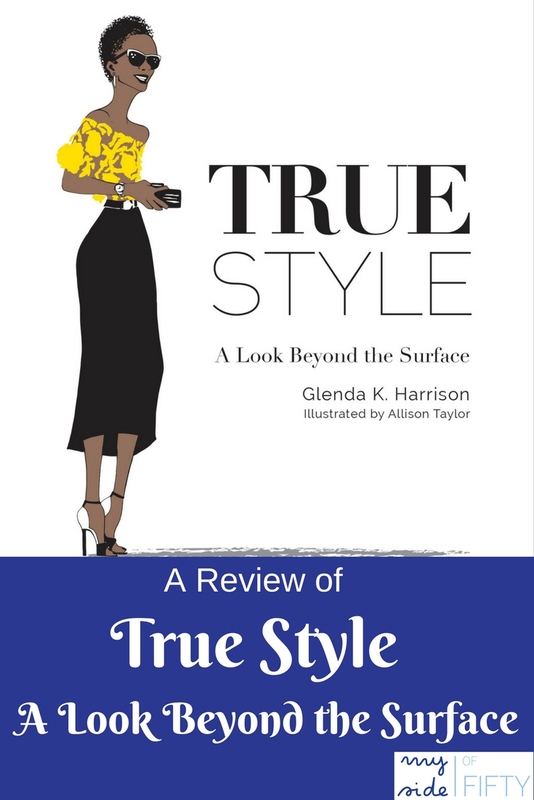 Her latest artistic endeavor is the book True Style: A Look Beyond the Surface, with illustrations by my daughter, Allison Taylor. 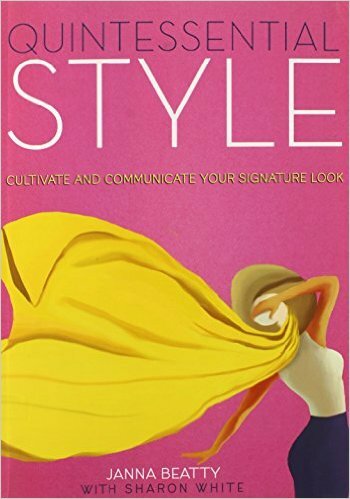 When you pick up a book about “style”, you may assume it will be about what’s “in style”. What the current trends are. How to dress for your body type. But True Style goes beyond that. Glenda takes us into her personal journey to discover HER true style, of which what one wears is only part of the equation. 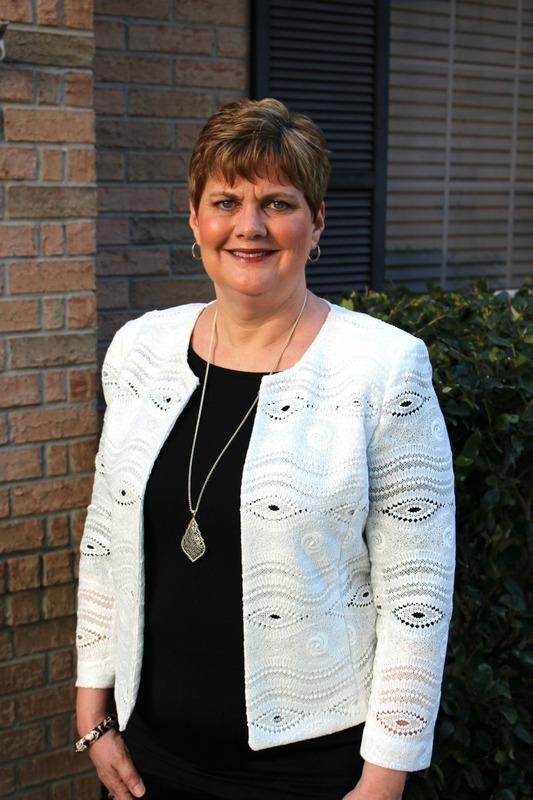 Glenda says a person having true style as one who is not swayed by what is “in style”. No.. a person with true style knows who she is, is confident in her choices, appreciative of her unique gifts (and I would add body) and embraces her story, both the good and the bad. Her sartorial choices are only the outward reflection of who she truly is on the inside. This book inspired me. I think shopping and finding clothes that I feel good in at this time of my life is a challenge. Reading True Style inspired me to “let go” of the fashion rules. The rules that say women my age can only wear “this” or shouldn’t wear “that”. The message that says my midlife shape must be covered and camouflaged. It inspired me to think about who I am, what I like and to dress accordingly. It truly “freed me up” to develop my personal sense of style! Beautifully written. Gorgeous illustrations. Inspiring message. 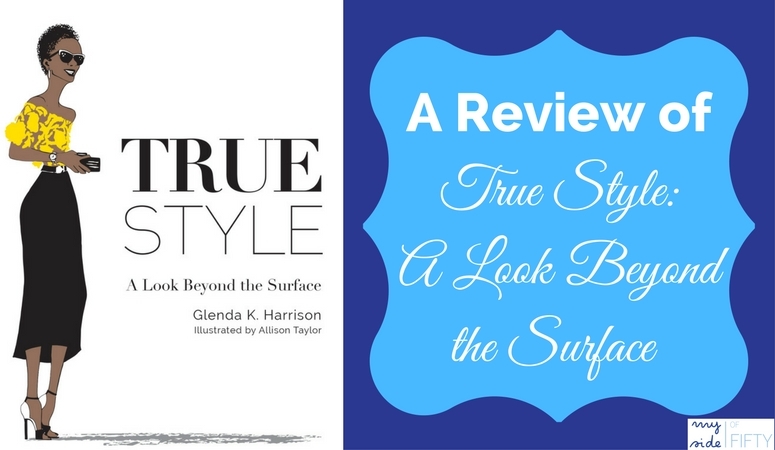 I highly recommend True Style: A Look Beyond The Surface. Like the post? Subscribe to My Side of 50. Get a weekly e-mail with all my blog posts PLUS subscriber only bonuses! 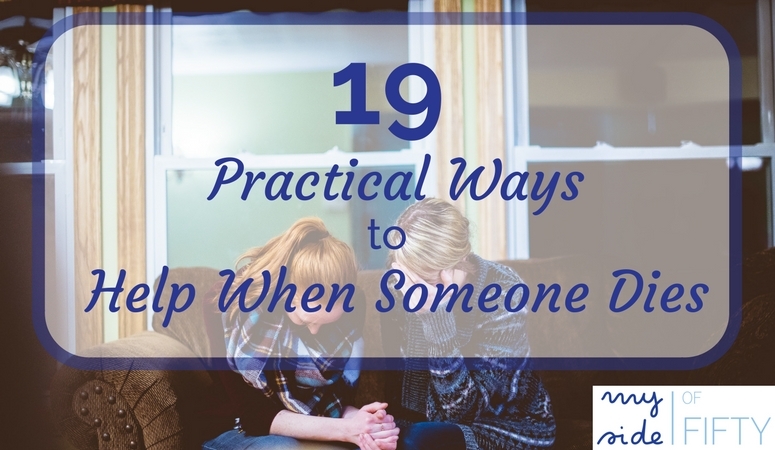 Share on Facebook or Pinterest! Social Shares help me grow this blog! Thanks! 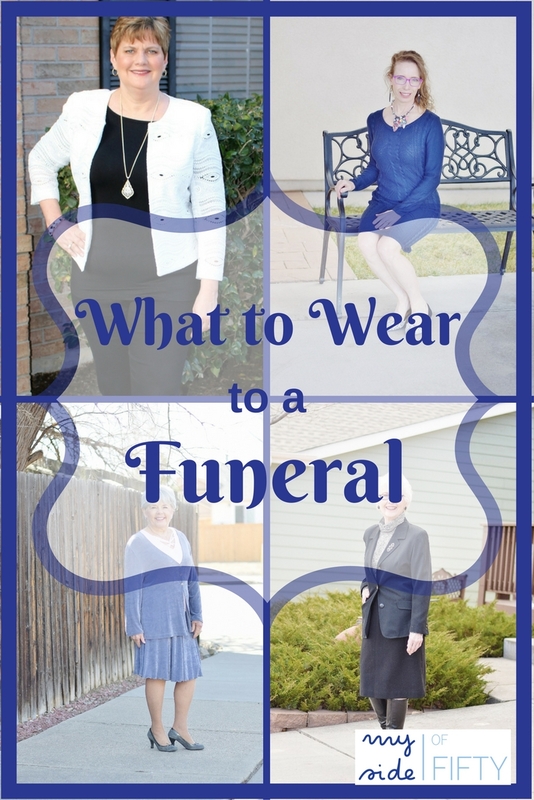 Do you ever get stuck on what to wear to a funeral? When my dad died in 2015, I had NOTHING to wear to his funeral. Nothing in my closet that fit anyway. So I spent a day at the mall wondering around aimlessly, trying on NEW clothes that ALSO DIDN’T FIT (as if I didn’t already feel bad enough) and went home empty handed. Would I just have to wear my Talbots “generously cut” shorts and t-shirt that I had worn all summer as I drove back and forth to the hospital every day? No, that wouldn’t do. 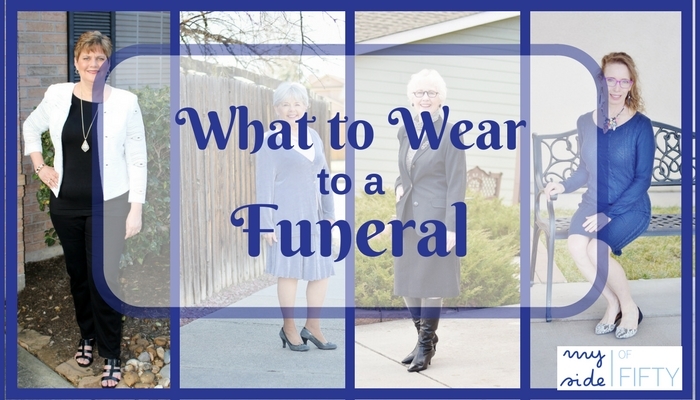 In the South, we still “dress” for a funeral. Maybe not quite as formally as we used to, but I wasn’t going to go to my Dad’s funeral looking less than my best. Thank the Lord for the wonderful ladies at my local Chico’s. I walked into that store after the disastrous trip to the mall, told them “My dad died, his funeral is tomorrow and I don’t have anything to wear.” Those kind ladies helped me figure out my size (because in the world of Chico’s, overweight women in the 50’s can still be a size 2), parked me in a dressing room and started bringing me clothes. I walked out of there with black pants, a black top with leather details (similar), a really cute and edgy kind of vest (similar) and the jewelry (similar) to go with it. I felt great. And since we were on a roll, they even outfitted me for a shower I had to attend the following weekend. I will be forever grateful to those sales ladies. I would never have been able to figure all that on my own. So….when Jodie from Jodie’s Touch of Style asked me to partner with her on this style post, I thought, no problem. I’ll just wear what I did to Dad’s funeral. The only problem is, I love the components of that outfit so much that I have worn them to death and am sick of them. So I went to Macy’s and got a couple of cute new pieces for the post, got them home and hated them. What to do? My sister-in-law who was visiting and was my photographer was about to go home. I had to figure out something. So I decided to “shop my closet” and here is the outfit I came up with. I’m kinda proud of myself! I started with a base of black. The Amazing Black Pants from Soft Surroundings and the Simple Comfort Top from Covered Perfectly. I wear both of these all the time. The pants have an elastic waist, but they are tailored in such a way that you’d never know it! The Covered Perfectly top is so soft. It’s thin enough to layer, thick enough so that everyone doesn’t “see your business” and long enough so that it’s not riding up. Then I found this Tahari by ASL Textured Crochet Knit Jacket that I bought for formal night on the Alaskan Cruise we took last summer. It’s “lacey” enough that you could wear to a more formal occasion, but casual enough for a daytime event. The pattern is gorgeous and I love the fit of Tahari jackets. 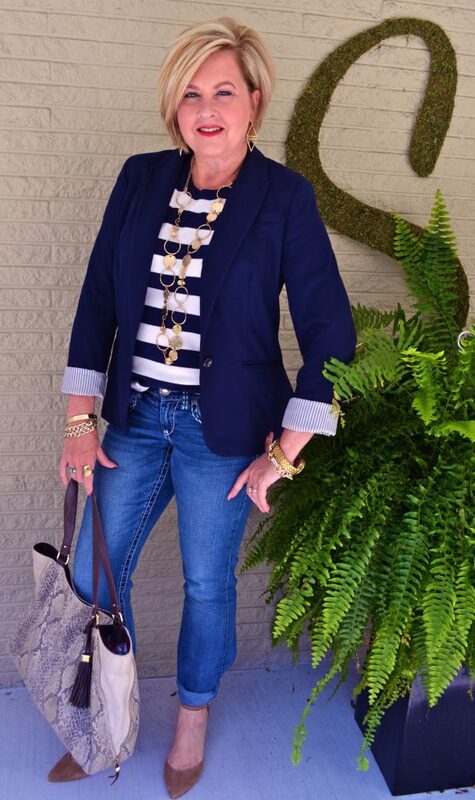 To accessorize, I wore my Kendra Scott Aiden Pendant Necklace. 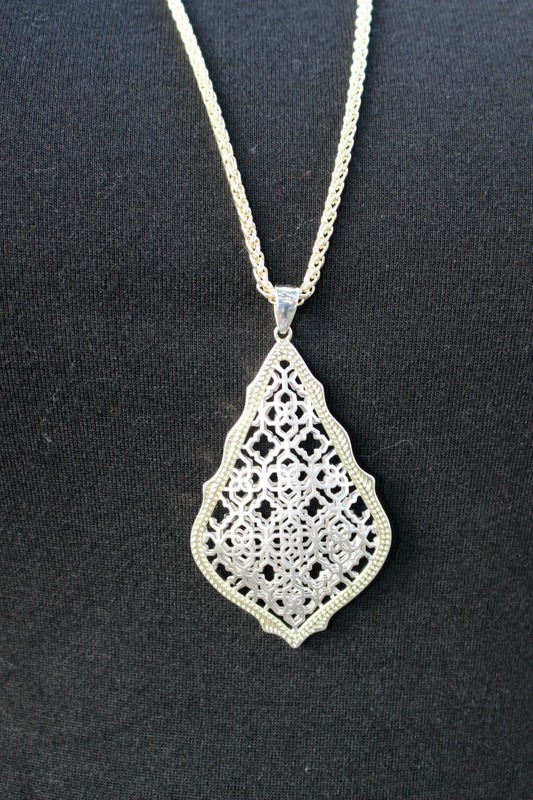 I usually wear a combination of gold and silver, so this necklace is perfect. Funny story – when my husband asked what I wanted for Christmas, I put 3 Kendra Scott necklaces on my list with the idea that he would pick one. He bought all 3! I’m not complaining. I guess he figured if he bought them all, there was no way he could get in trouble. 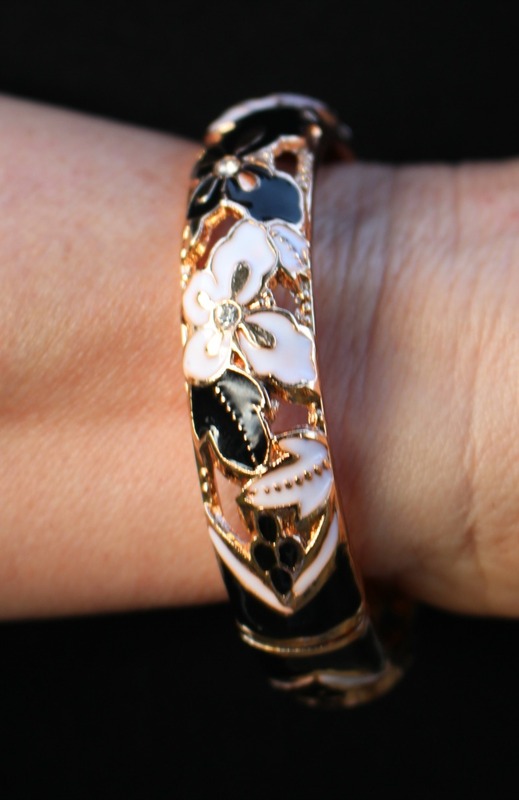 My Cloisonne Bracelet was a gift from a dear friend that I wear ALL THE TIME. I wear a lot of black and white so that it goes with everything. And I just have to show you my ring. The diamond in the middle is the diamond from my Mom’s engagement ring. 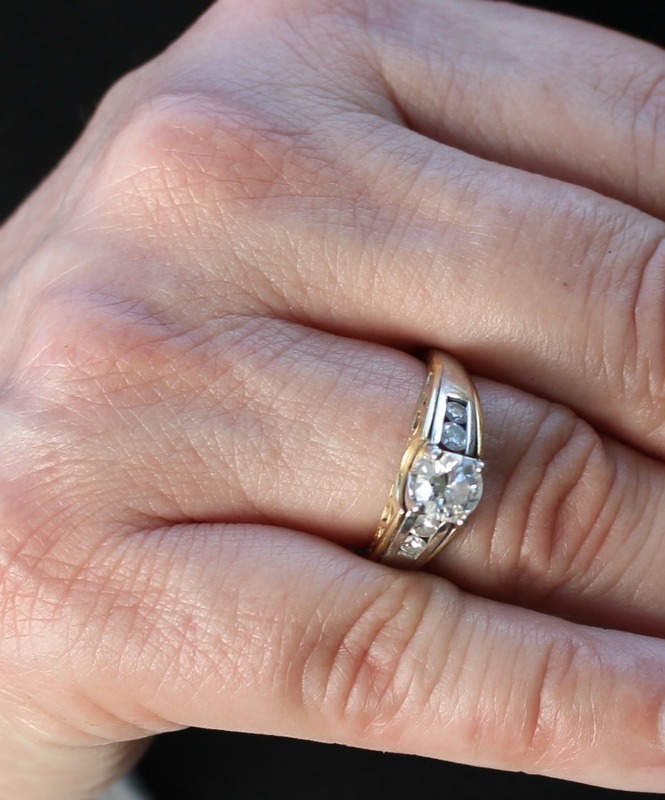 The 4 diamonds on the side are from the 10 diamond ring that Dad gave her on their 10th anniversary. It’s also two-tone. I wear it every day. Feels like I have my Mom close to me all the time. Now over to Jodie’s Touch of Style to see the outfits that these 3 ladies are wearing. I love this blog. Each week, Jodie has a fashion theme and shows outfits for ladies in their 50’s (she’s the 50’s model), 60’s (her stepmom, Nancy is the 60’s model), and 70’s (her mom, Charlotte is the 70’s model). They are just lovely. Here’s a sneak peek. I love that they feature some options besides black. Click here to get the details on their looks! Did you like the post? Subscribe to My Side of 50! Weekly e-mail with my latest posts AND subscriber only bonuses! Join the My Side of 50 Facebook Group here! Stripes. They are supposed to be “on-trend” for Spring 2017. Frankly, I never knew they weren’t “on-trend”. I just thought some clothes had stripes and some didn’t. In fact, I remember a time not too long ago when most of the shirts in my closet were tees of varying sleeve lengths – all with a stripes somewhere. I even had a year where I vowed not to WEAR STRIPES. But here we are in 2017 and I’m noticing all these wonderful ways to wear stripes other than a tee with horizontal stripes. 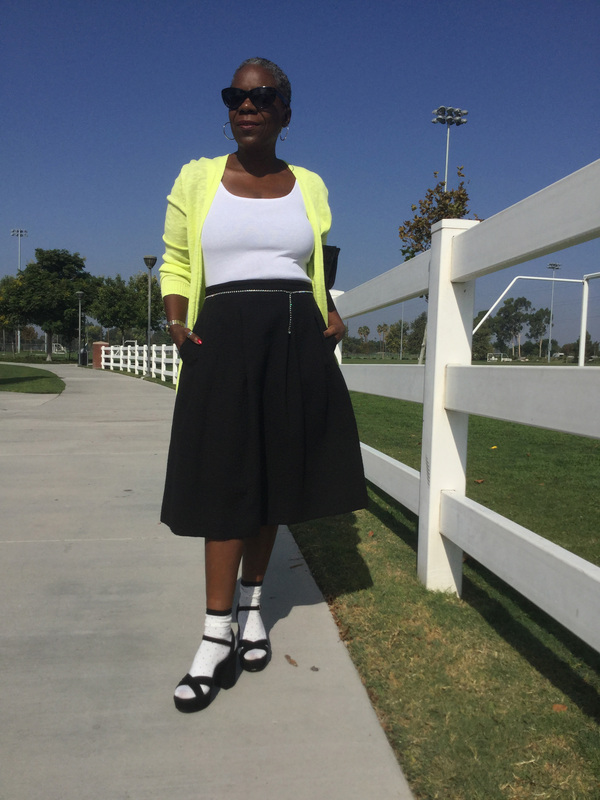 Enter my favorite fashion bloggers – all midlife women of various sizes and shapes. They know what looks good on them and why. They know how to shop. And they can find flattering clothes at any price point. I love them. I want to adopt them. I want them to go shopping for me (not with me – I don’t like to shop) and bring home a bunch of clothes that will fit and look good on me. But since that is unlikely to happen, I’ll continue to read their blogs for education and look at their beautiful photos for inspiration. Think You Can’t Wear Stripes? 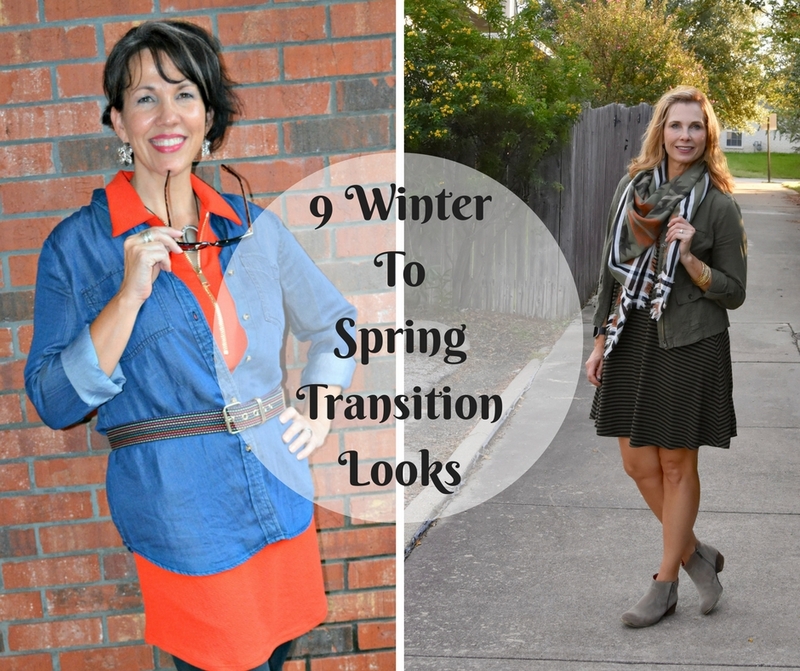 Here are a couple of great looks from Jennifer at A Well-Styled Life. I also like the panel at the waist with the vertical stripes. It accents her small waist and breaks up the horizontal design. Here is Tania from 50 Is Not Old wearing horizontal stripes. In this picture she wears a blazer with her horizontal striped tee that breaks up the pattern, creating a very flattering look. Tania’s long, gold necklace also adds length. Add a striped scarf to your outfit! Scarves are such a versatile fashion accessory. 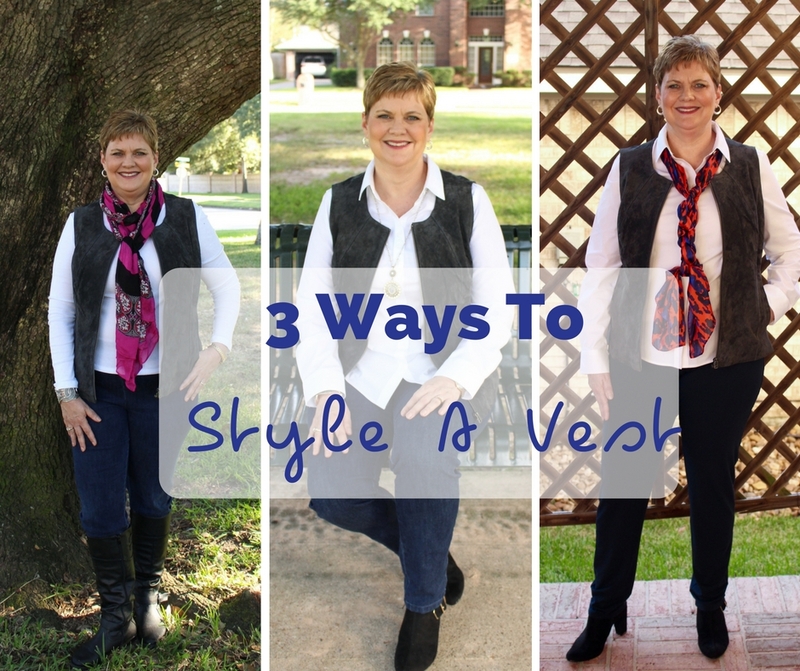 Get 3 Fashionable Ways to Tie a Scarf HERE. Tania gets the same effect here with a striped tee with side panels. 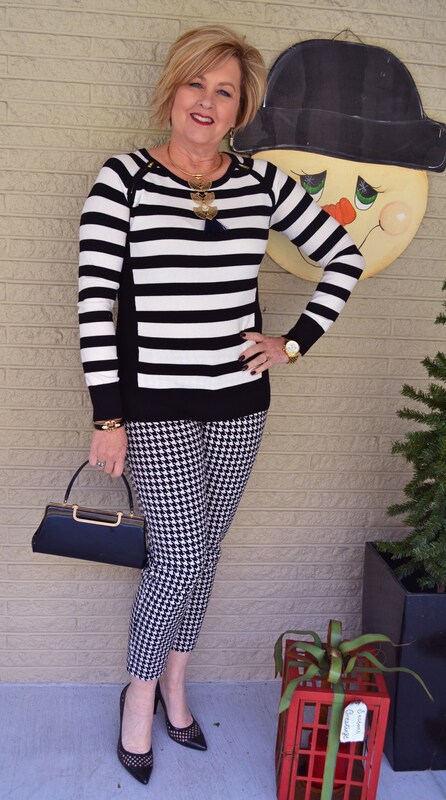 And she mixes stripes with houndstooth. You know how mixing patterns freaks me out. I just never got the hang of it, but I LOVE Tania’s look here! 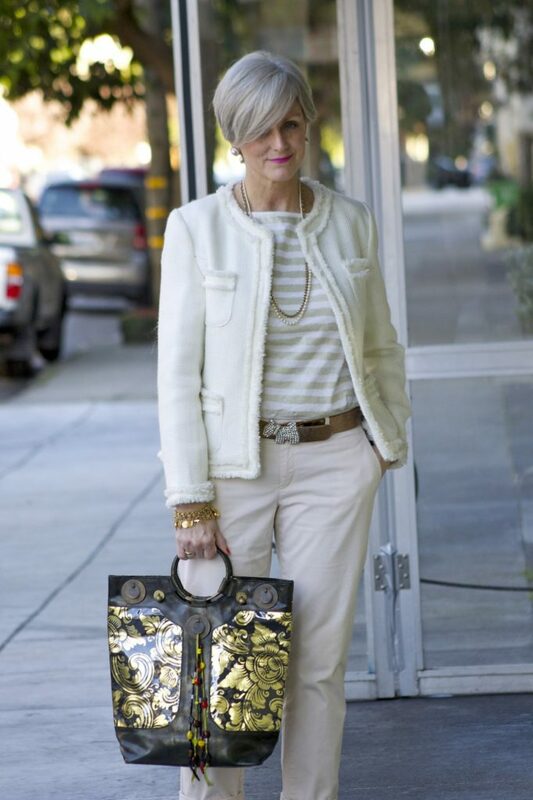 And Beth from Style At A Certain Age has the same look, but in more monochromatic colors. Just gorgeous. And finally – two looks from Julia at When The Girls Rule. She’s one of my favorite new-to-me fashion bloggers. And every time I share the link to one of her posts, a billion of you click to see it, so I know you like her too! Julia is short, apple-shaped and large busted. Her blog is all about dressing in a way that makes you feel confident, no matter what your size or shape. Here she wears a sweater that mixes horizontal and vertical stripes. It’s a bit asymmetrical, falling to a point on both sides. And the fit overall is just perfect. You know, fit really does make all the difference. And here she is wearing a pencil skirt with the stripes on the bottom. 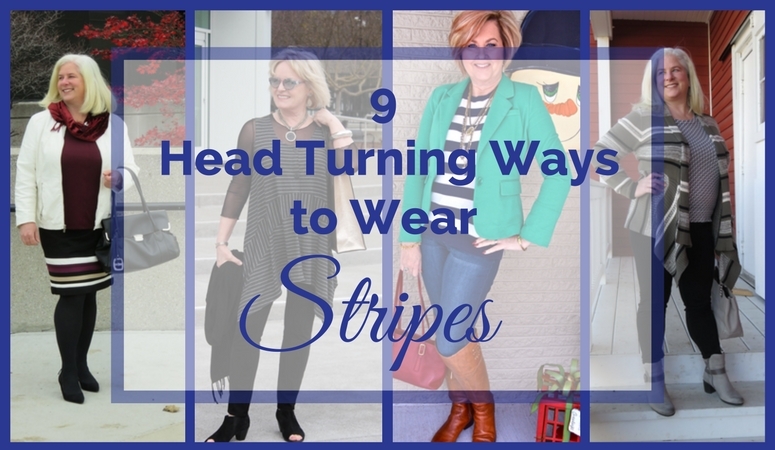 All kinds of ways to wear stripes without wearing them all over! You can always add stripes to your wardrobe with your purse or shoes. 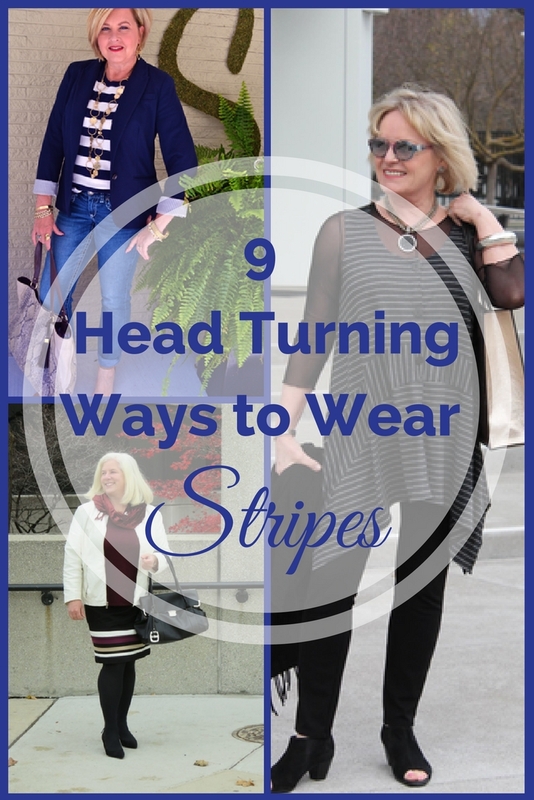 What is your favorite way to wear stripes? Pin this post to your fashion inspiration board for easy reference! What To Wear To the Park? The weather in Texas is mild and gorgeous these days – perfect for a trip to the park with my granddaughter, Madeline, aka “Maddie” or “Maddie-girl”. For this trip, I chose the Covered Perfectly Simple V.
The Simple V is my “go-to” top for just about every occasion these days. The long sleeves provide just enough cover for a semi-cool afternoon. The fabric is SO SOFT and breathable. And it moves – which is important when chasing and lifting a 2 1/2-year-old around the park! I also like that it’s long enough to provide plenty of coverage when I lift my girl up high (which as she grows is getting harder to do!). I love the Simple V so much, I own it in several colors. It’s the perfect top for layering with a vest, cardigan or jacket. 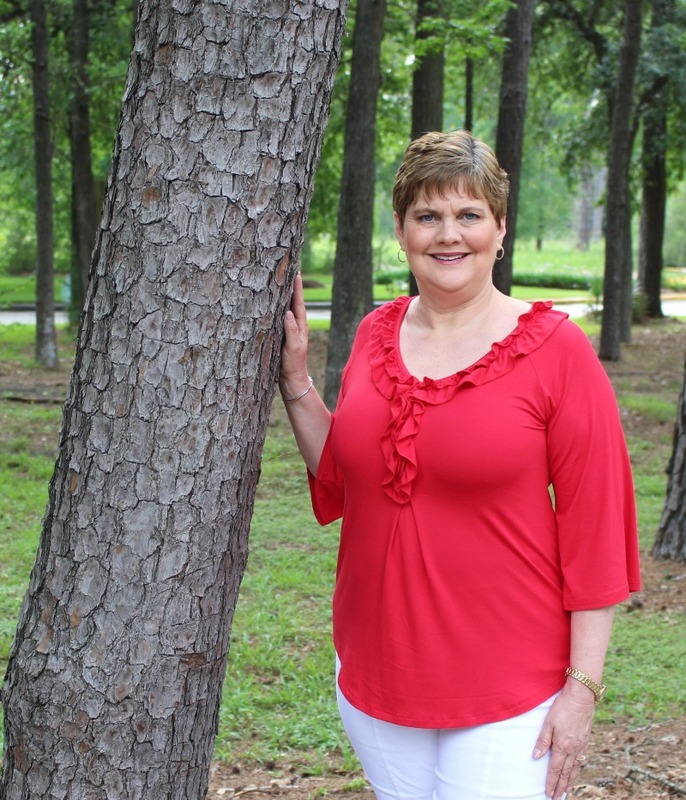 Covered Perfectly has a complete line of clothing designed specifically for midlife women that includes tops, dresses, vests and their very popular leisure suit. The fabrics are soft and easy-care. The cuts are flattering, providing just the right amount of coverage and draping. Covered Perfectly is offering a great deal! Buy 2 tops and get a 3rd for free AND free shipping for orders over $47. And I’ll let you in on a little secret. 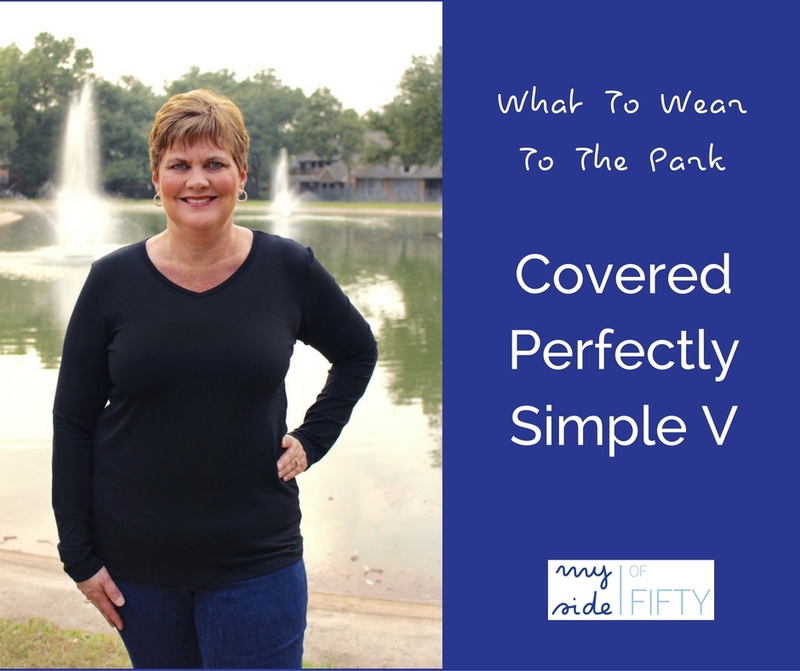 Although the Covered Perfectly line is designed with the midlife woman in mind, midlife women aren’t the ONLY women who wear these great clothes. Several of my friends report that their daughters are “raiding their closets” and wearing their Covered Perfectly tops! 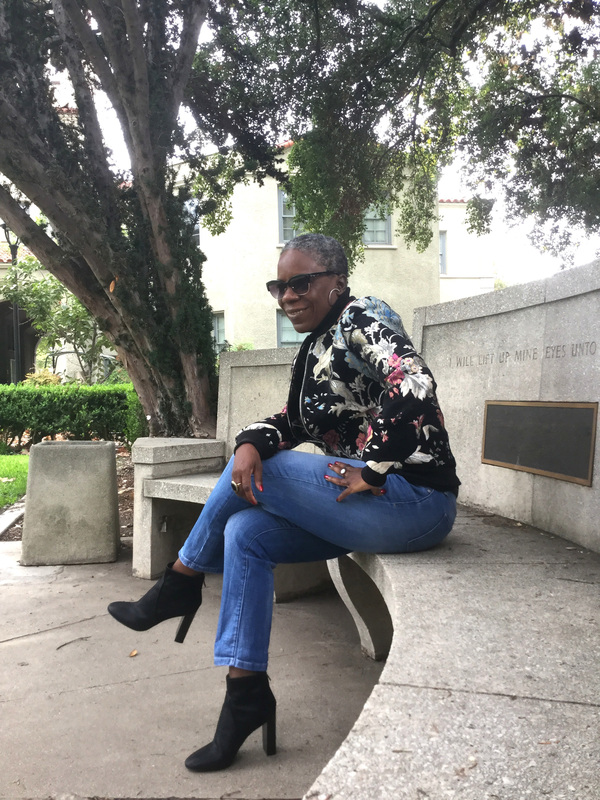 See how my friend and midlife fashion blogger, Jodie, styles 3 different Covered Perfectly tops here. All of Jodie’s posts features styling for her (50’s model), her stepmom, Nancy (60’s model) and her mom, Charlotte (70’s model). All stylish and lovely! Take advantage of Covered Perfectly’s buy 2 get 1 free offer! Get a couple for yourself and one for a gift! Disclosure: This post contains affiliate links. If you purchase products through my link, I will receive a small commission at no extra cost to you. Covered Perfectly provided the top for this review. Words and opinions are my own. There are so many ways to wear a vest, making it one of the most versatile pieces in your wardrobe. DISCLOSURE: I AM PARTICIPATING IN A COMPENSATED CAMPAIGN WITH THIS BRAND. THE STYLING AND THE WRITTEN WORDS ARE MY OWN. This Genuine Suede Vest from Chadwicks of Boston is my latest find. It is the perfect layering piece. Especially in Texas where we don’t have many REALLY COLD days, this is great fall piece. A little warmth when we need it and not a lot of bulk. It is so soft, has POCKETS and the Princess seams down the front give it a shape that is so flattering. 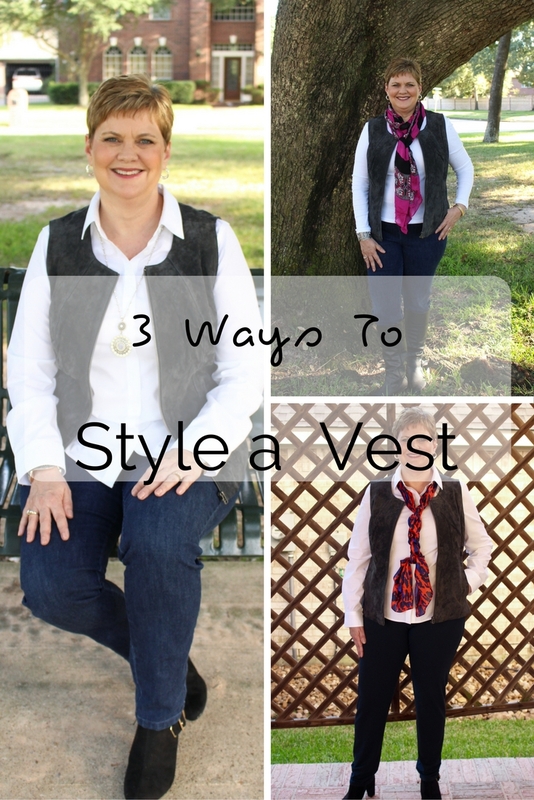 Here are 3 Ways to Wear A Vest. With a crisp white blouse, jeggings, 2 -tone necklace, and booties. This is a great look for shopping and lunch with a friend. Pairing it with navy slacks and a silk scarf, I dressed it up for the office. In Texas, we love our football and this look with a long sleeved tee, riding boots and pink scarf to bring in color around my face is perfect for a tailgate party! Have you ever ordered from Chadwicks of Boston? I ordered from Chadwicks frequently in the 1990’s when I had two small kids at home. Two small kids that I DID NOT want to drag to the mall! So the convenience of ordering from Chadwicks and trying on clothes at my convenience, in my own home and being able to mix and match with what I already had was a big selling point for me. And I remember that the prices were great and clothes were always cute, quality and on trend. Nothing has changed! Today’s Chadwicks features the same great quality, affordability and ordering is easier than ever. 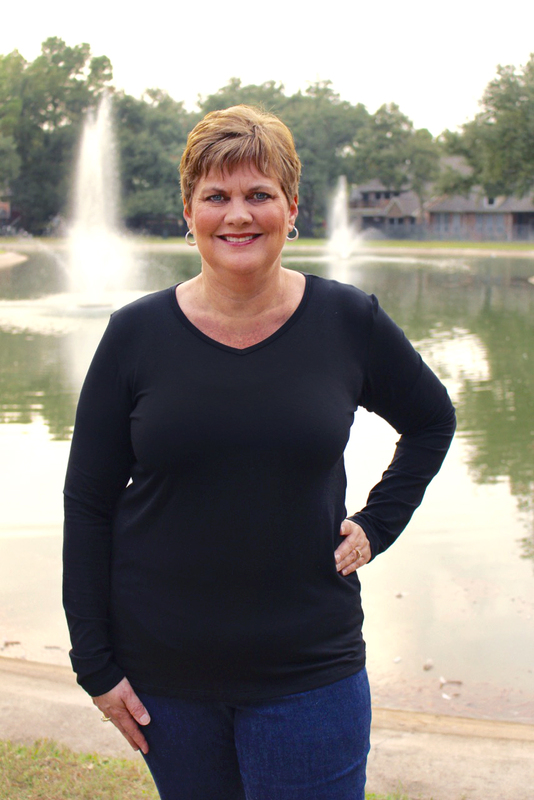 And now Chadwicks has incorporated new fit guidelines, featuring TALL, Petite, and Plus sizes, giving midlife women of all shapes and sizes choices in all styles. Check out Chadwicks today. Stylish, quality, affordable clothes. By the way, the Genuine Suede Vest also comes in a beautiful tan color called Sable. This post on What To Wear Shopping contains some affiliate links for your convenience. If you purchase a product through my link, I may receive a small commission. I so appreciate every click-through and purchase! Every little bit helps to keep My Side of 50 up and running! When I visit my daughter in Austin, our go-to activity is shopping and lunch! Our recent destination was The Domain, an upscale outdoor shopping mall interspersed with gorgeous landscaping and artwork. While I wanted to be comfortable, I also wanted a very “put together” look, so I chose this “Twofer” top from Covered Perfectly. 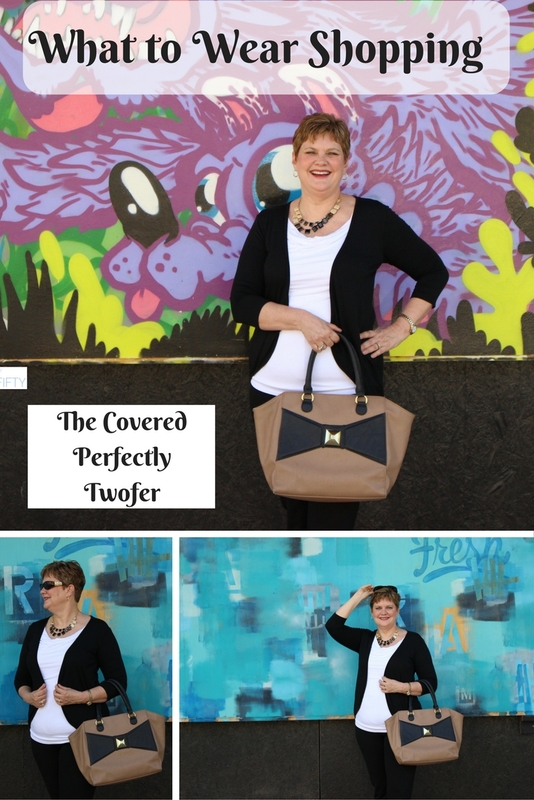 The Twofer by Covered Perfectly is chic and comfortable. Perfect for a day of shopping! It looks like a two-piece cardigan and shell, but it is actually one piece. It’s made of MicroModal fabric that is so soft and breathable. And believe me, with fall temperatures that can reach into the 90’s in Texas, you WANT breathable. It packed beautifully for the trip and is easy care to the max – machine washable and I hang it up to dry. The neckline has a beautiful drape that doesn’t come too low. The white inset and ruching are very slenderizing, especially across the tummy where a lot of us in midlife need help. It’s longer in the back than in the front. Who can’t use a little extra covering in the back? The Twofer comes in several color combinations and is a great year-round piece for my wardrobe. 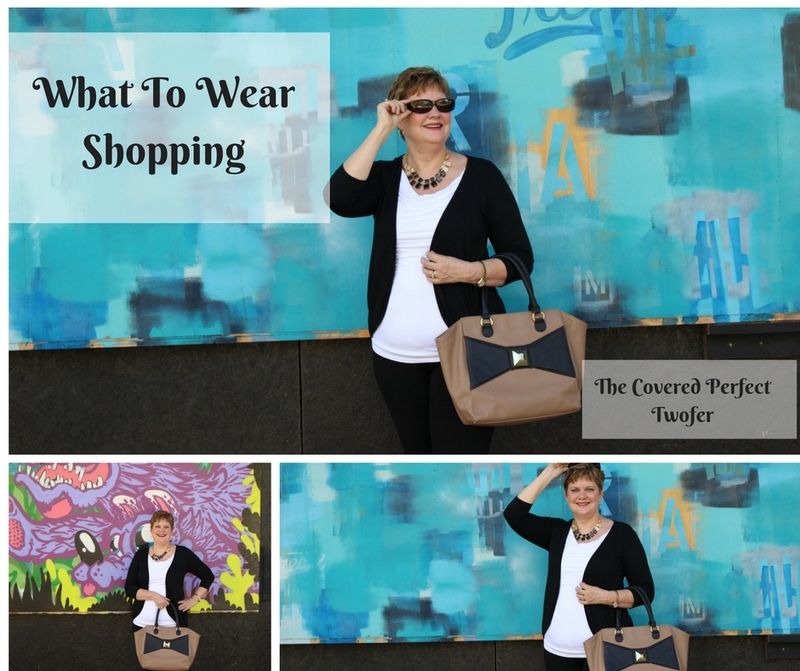 Check out Covered Perfectly’s line of flattering clothes for midlife women. There are statement pieces like the Twofer and lots of basic tops that are perfect for layering. All at great prices. I have several! My Side of 50 readers get a 20% discount on up to two items! Use the discount code MS20 when you check out at Covered Perfectly. There are several styles to choose from, and the discount will apply on up to two items. You may also take advantage of the buy 2 get 1 FREE special. Only one of the discounts will work. This post also appeared on Covered Perfectly’s Blog. I updated this post in February 2017. 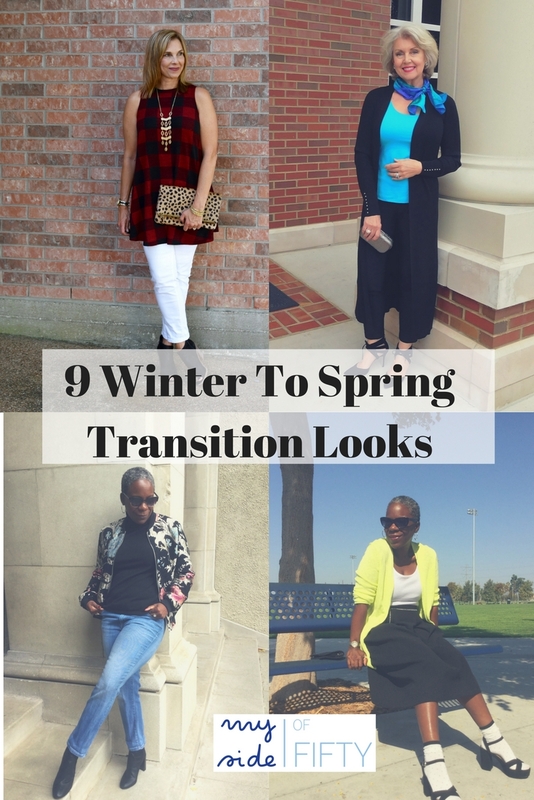 Many of these Fall looks make great Winter to Spring transition outfits. Affiliate links to similar pieces have been added. Many of these pieces are at end-of-season sale prices! Oh how I love my Fashion Blogger friends! These are real gals, living on real budgets, with the bodies of real midlife women. They travel, they work, they play with their kids and grandkids. Their clothes have to be versatile and they are more likely to pick up a few key pieces each season to work with what they already have than go out and buy a whole new wardrobe. So check out these Fun Fall Looks From My Favorite Fashion Bloggers! Shelly is my girl. She lives in Southeast Texas not far from me and totally feels my pain when it is pushing 100 degrees in late September. But heat and humidity be damned – Shelly finds a way to keep cool and dress for fall at the same time. Shelly wearing a sleeveless swing top in Buffalo check & white skinny jeans. 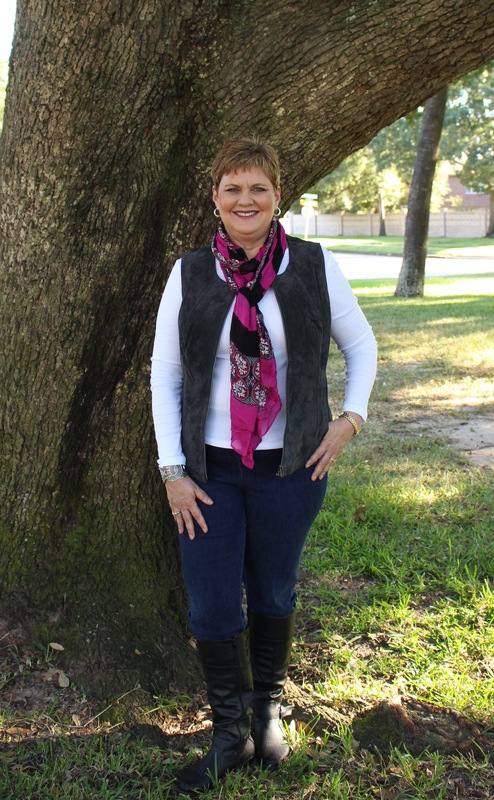 The sleeveless top in a Fall fabric is perfect for hot fall days in Texas. Buffalo Check sleeveless dress worn as a tunic over white skinny jeans with leopard clutch and booties. Red & black check says fall. Sleeveless says “Fall in Texas”. Love this look. Shelly paired her floral top and white skinny jeans with a mustard colored light weight cardigan. The fall color of the cardigan takes these summer staples right into fall. Here she wears those same white skinnies with a floral top. She adds a mustard color cardigan for a touch of fall color and her Texas Aggies spirit is showing through in those cute maroon colored booties. Shellie wearing a Chambray shirt tucked in knee length shorts. 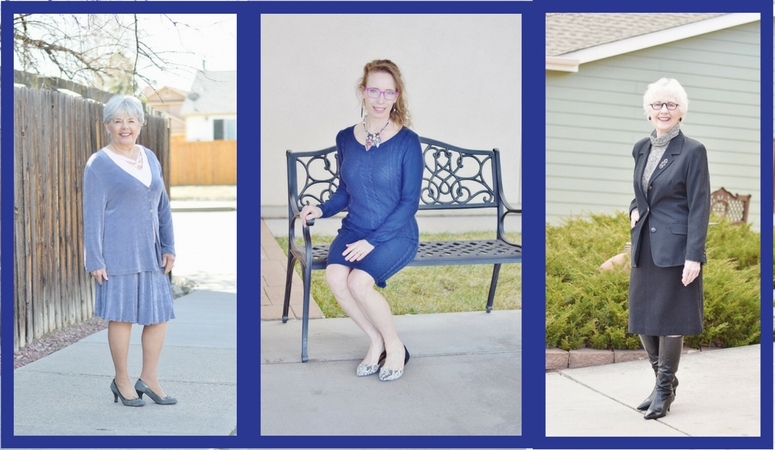 Shellie dresses up her Chambray shirt with an asymmetrical, wrap skirt and wedges. I have followed Susan on Facebook and Instagram for quite a while. She is so lovely and chic. But if you follow her closely, you’ll see she doesn’t wear a LOT of different clothes. She has a basic color palette – white, black & denim that she has learned to style so many different ways, you’d think she had 10 closets full of clothes. 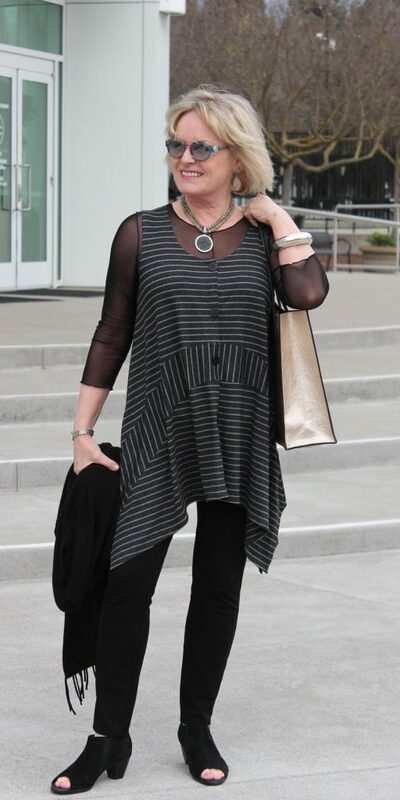 Susan’s versatile black tank dress can be worn with a jacket or sweater, boots & tights or sandals & a straw hat. Susan adds color to her black wardrobe staples with the colorful tank and scarf tied near her portrait area. In this picture, Susan’s core pieces are black pants and a black duster. The blue top and printed scarf add color and texture near her face. As we age, we lose color, so having colorful pieces near our faces can brighten our whole look. Also, as another fashion blogger friend, Jennifer Connolly once told me “texture NEAR our face minimizes the texture ON our face” – if you catch my drift! Tying a scarf near our “portrait area” avoids adding more bulk at the bust. If I am wearing a larger scarf with more texture for warmth, I will tie or wrap it so that it hangs in smooth straight lines rather than adding more fluff where I am already “fluffy”. Glenda is my fashionable friend who is bold, confident and fashion forward in her look. She inspires me to step out of my comfort zone and think about who I am and what I am portraying when I get dressed to meet the world every day! Structured shoulder tuxedo jackets paired with deconstructed denim. Cardigans with bell sleeves or creative interest with flutter backs paired with a classic equestrian look. Combining a baroque-inspired floral bomber jacket with unexpected pieces like a metallic skirt, velvet jeans or classic denim. Since I enjoy adding interesting elements to my wardrobe, these tricked-out, classic, outwear choices will give me just what I need. A) You have the personality to wear it with confidence. B) You select ankle socks that compliment your look with subtle color variations. C) Make sure your socks do not have re-enforced toe and heel in a different color. Meaning, if your sock is white with black polka-dots, you do not want the toe and heel to be black. What do you think? Did you get some new ideas to try? New combinations from your own closet? If you like this post, please share it. Pin it on Pinterest or Share it on Facebook. Get Your Midlife Style Back: How I Did It! This review of Quintessential Style contains some affiliate links for your convenience. If you purchase a product through my link, I may receive a small commission. I so appreciate every click-through and purchase! Every little bit helps to keep My Side of 50 up and running! 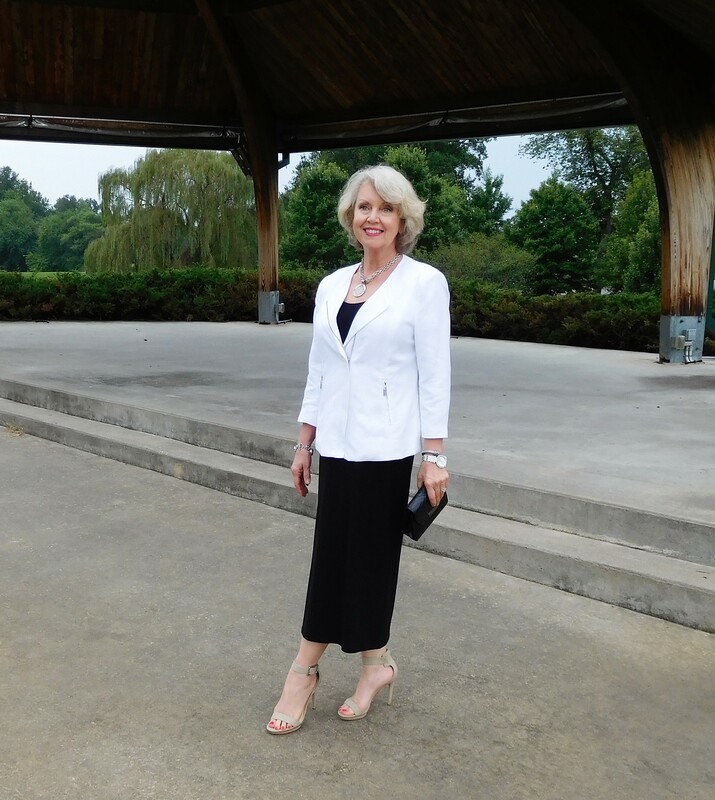 I have written several blog posts about how it has been hard for me to find my “personal style” or any sense of style that I feel good about in midlife. 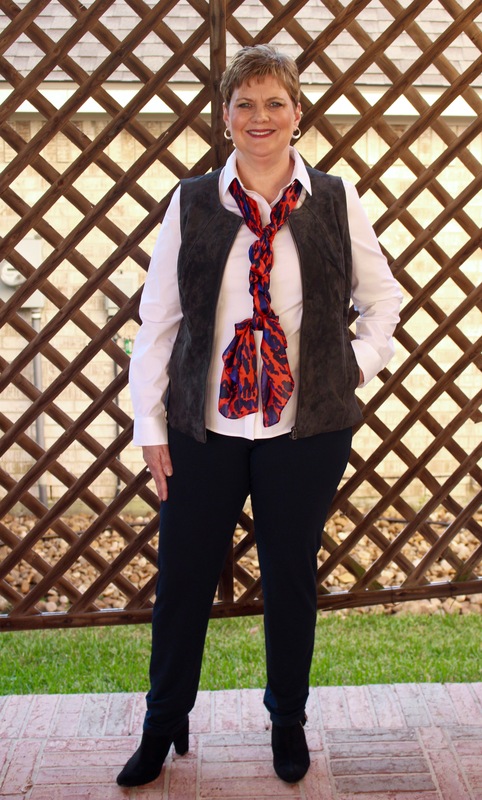 Midlife weight gain, the difficulty in finding clothes that are both comfortable and stylish, knowing what is on-trend or how to mix, match & accessorize are all factors that contribute to me feeling less than confident when it comes to getting dressed every day. Worksheets to help you determine what you want to communicate through your look. Your best colors, taking into account your skin color, hair color and contrast between the two. 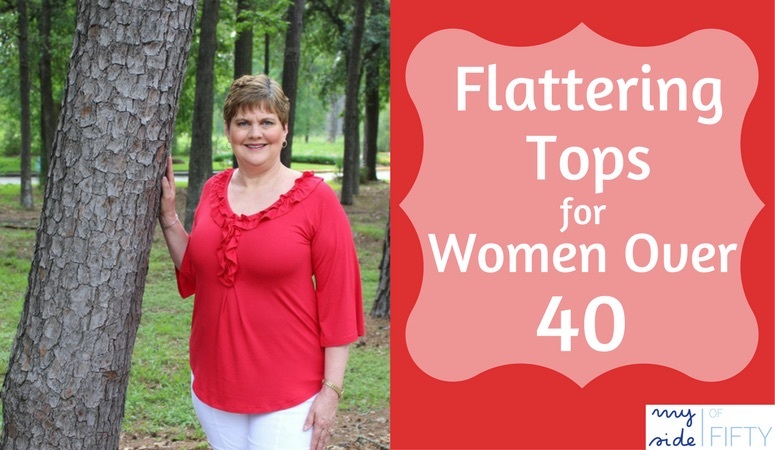 How different cuts of clothing and types of fabrics can flatter your figure. How to put together a basic wardrobe with a few classic pieces and use accessories to create many different looks. Tips for skin care and makeup that enhance your natural beauty in midlife. 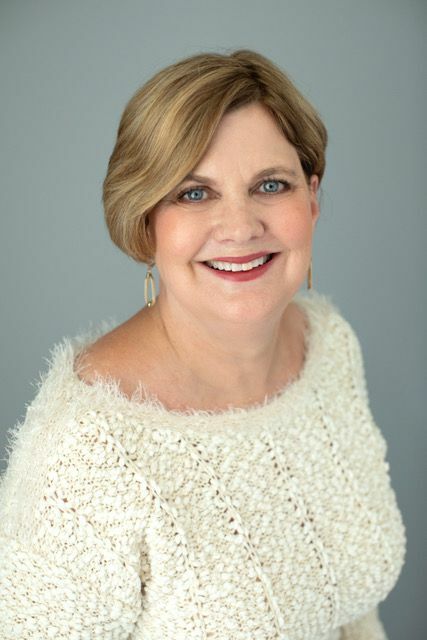 In Quintessential Style, author Janna Beatty brings over 30 years of experience in the beauty consulting business. She has studied in New York and Paris with some of the most respected advisors in the beauty and fashion industry. You can purchase Quintessential Style: Cultivate and Communicate Your Signature Look here. Get Your Midlife Style Back – How I Did It! 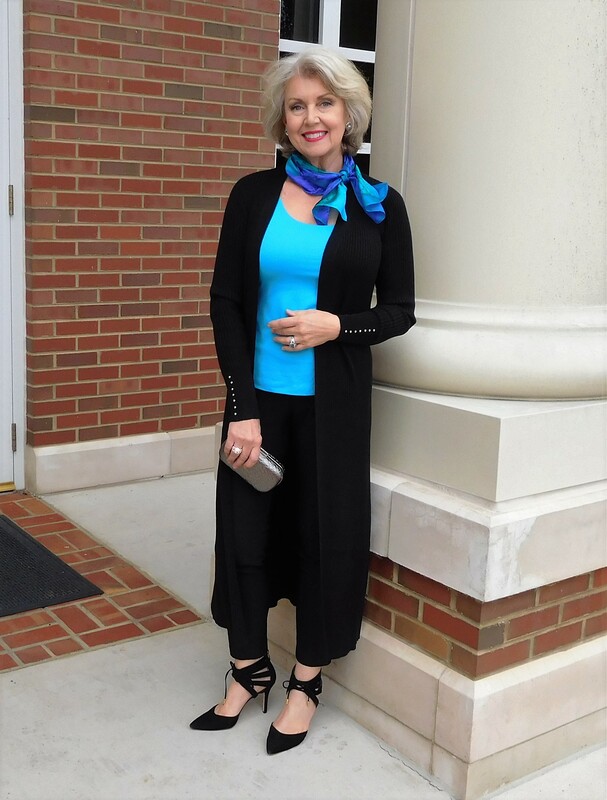 Today we wrap up our series of fashion posts with a guest post from ME about midlife style on Shellie Bowdoin’s site, The FABulous Journey. You’ll recognize Shellie from my two posts where I feature lessons I learned from my favorite fashion bloggers. 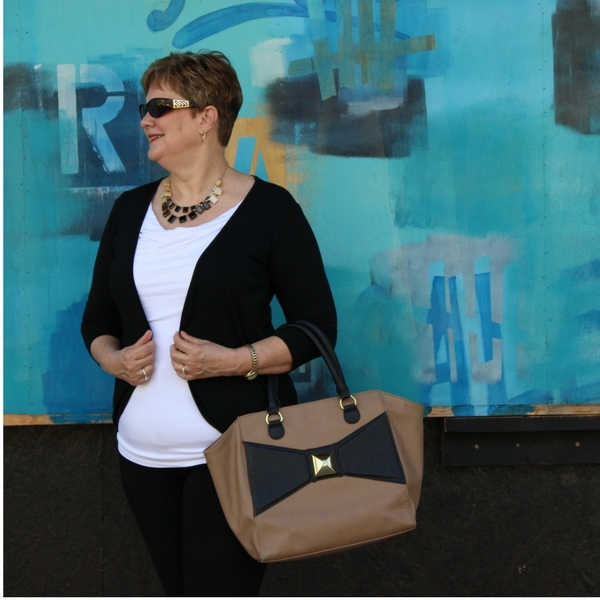 This time, Shellie asked me to write about How I Got My Midlife Style Back. I have to laugh at the irony of this as I sit at my desk in short shorts, ratty t-shirt and no make-up, bra or shoes because everything I own is either in the laundry or in my suitcase that is packed for our vacation. You wouldn’t look at me now and think I had any business writing a fashion post! LOL! 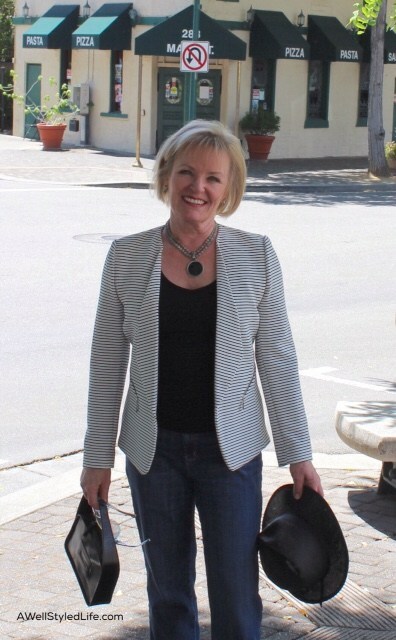 Get Your Midlife Style Back – How Cathy Did It! But seriously – Getting My Midlife Style Back hasn’t been easy. This 57-year-old body has grown and changed and finding stylish clothes that fit well or even knowing what looks good on me is a challenge! I have learned some valuable fashion tips from Shellie and others that I follow that help me feel more confident and fashionable when I do have to be seen in public. Shellie is the “real deal”, as they say. While she is lovely and fashionable and always looks put together, her blog also talks about other issues that are important – health, fulfillment and personal growth. You can read more about her here. 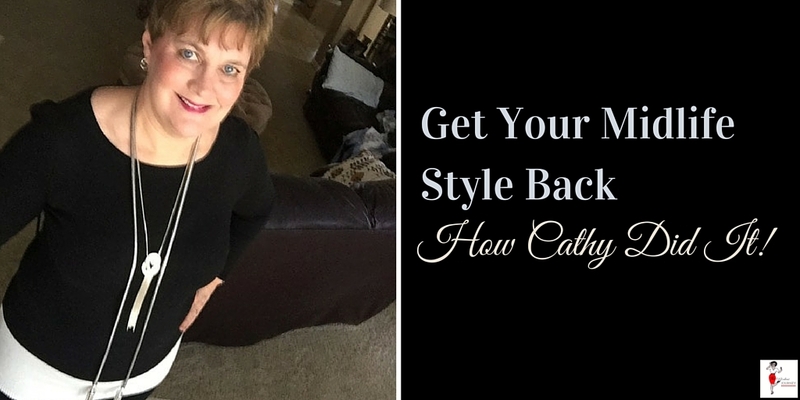 Join me over at The FABulous Journey today for Get Your Midlife Style Back – How Cathy Did It!